In addition to printing and mailing services, Web Offset offers our customers a full service bindery department. At WebOffset we have the capability of saddle stitching or perfect binding. Saddle stitching is a great option for a small book or magazine. This method is easy, professional looking and inexpensive. Perfect binding is “perfect” for your high quality printing jobs. The speed, quality and affordability of perfect binding make it an attractive option. It is the most popular way to bind paperback books and a common choice for web offset printing jobs. 3 hole drilling is perfect for those print jobs that need to go into a binder such as employee or instruction manuals. 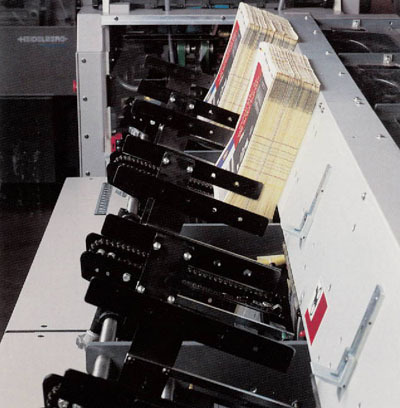 Our new state of the art inserting machine is capable of inserting tabloids, standards or books at a high rate of speed. It can even place a sticky label on the front page while your product is being inserted. This type of multitasking decreases the time it takes for us to finish your print job. WebOffset specializes in fast turn inserted weekly products. If your printing job has any special trimming needs we have computer controlled cutting machines for quick and accurate trimming and can fulfill most requests. Whatever your printing and bindery needs are, Web Offset can make it happen.